I was born in Bogota,Columbia, South America. 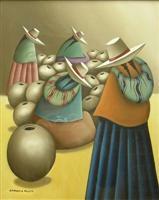 Although Britain is now my home, my work reflects many aspects of my early life in Latin America. Columbia is a country of contrasts: tall mountains and sandy beaches, farmland and jungle. It is warm and sunny so people are colourfully dressed and daily life is filled with many activities, but music, dancing and gaiety are everywhere. In my work I try to reflect this. There is great variety of rich vegetation, colourful birds and butterflies and these too feature in my work. Columbia is also a land of legends and history and some of my work illustrates these aspects. I have produced a series of illustrations for children’s books.